How to Import XAVC footages to Adobe Premiere Pro CS6? Up to now, Adobe Premiere Pro CS6 seems to work fine if you import your XAVC footages directly from cameras, but if you have already copied XAVC recordings to your HDD or you download them from somewhere, the importing error may jump out. If you accidentally meet with the problem, the best solution is to convert XAVC to MPEG-2, the format which is proved to be the most compatible one with all the Adobe products, including Adobe Premiere Pro CS6. The most important part is how to find out the best XAVC Converter among so many options on Google and Bing. 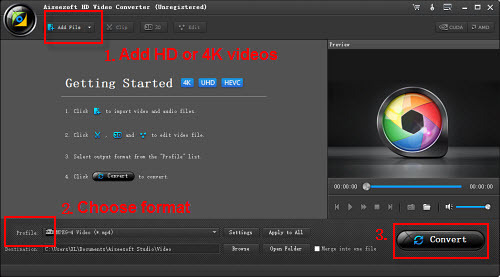 Here recommend the most professional XAVC Converter for Adobe Premiere CS6, applying which you can get your XAVC converted with lossless video quality at about 5X faster speed than other converters, thanks to its support for the NVIDIA CUDA & AMD APP(ATI Stream) acceleration technologies. Besides, the UFUWare XAVC Converter is also designed with some useful functions, including joining imported clips together for easy importing, trimming section of your file, adding text/image/video watermarks to your original files, replacing audio tracks, etc. Thus, it is highly recommended on many forums. Step 1: Free download the XAVC to Premiere Pro CS6 Converter for Wins and install it on your PC. Run it and import your XAVC files into the XAVC Converter. Step 2: Hit the Format box and select Adobe Premiere/Sony Vegas –> MPEG-2(*.mpg) as output format and then set the output destination as you want. If you want to keep 60fps as frame rate after conversion, please choose WMV (VC-1) (*.wmv) as output. Step 3: Adjust video and audio parameters, including the Bitrate of Video and Audio, the Codec of Video and Audio, Video Size, Sample Rate, Frame Rate, Audio Channels, etc., in the Profile Settings to get XAVC files converted with original quality. Our recommedation of the settings is shown on the screen shot. Step 4: Click the “Convert” button to start converting XAVC footages for importing to Premiere Pro CS6 with original quality. After the XAVC to MPEG-2 conversion, you can import and edit your recordings in Adobe Premiere Pro CS6 without any incompatibility problem. Besides the capability of making XAVC work with Premiere Pro, including Premiere Pro CS3/CS4/CS5/CS5.5/CS6/CC7, the versatile XAVC Converter can also convert XAVC files for importing to Adobe After Effects, Adobe Premiere Elements, Sony Vegas, Avid Media Composer, Windows Movie Maker, Magix Movie Edit Pro, etc. If you want to know more about the converter and conversion, please link to UFUWare’s XAVC Converter Page.